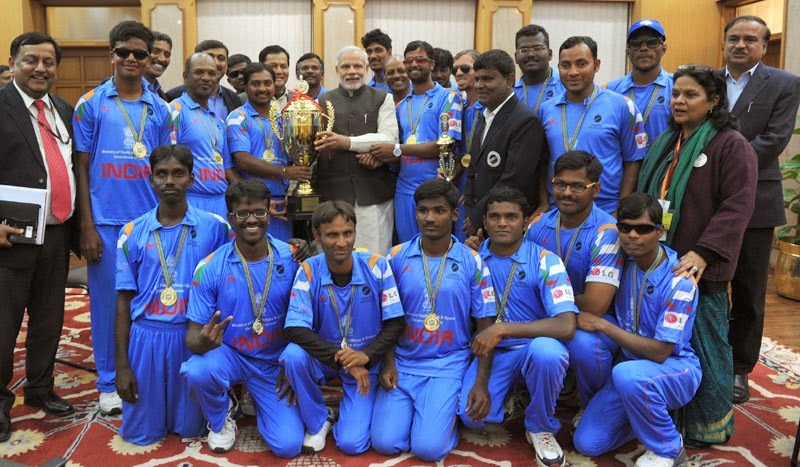 The Prime Minister, Shri Narendra Modi, today met India`s Blind World Cup winning team. The team had won the 4th ODI World Cup, 2014 for the Blind, hosted by South Africa earlier this month. 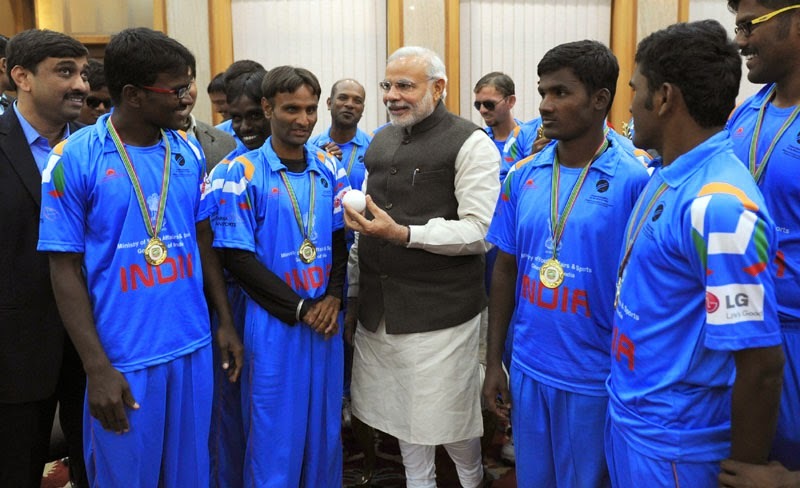 The Prime Minister was presented a special cricket ball which is used for blind cricket. He later asked the players to sign on the ball, adding that he would present this ball to a museum in a cricket club. 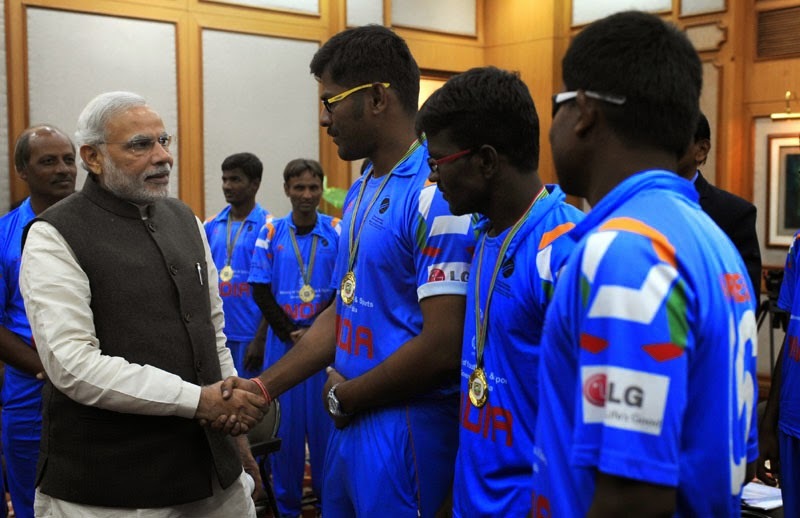 The Prime Minister told the players that they had not only brought laurels to the India, but had also inspired many physically challenged people through their feats. 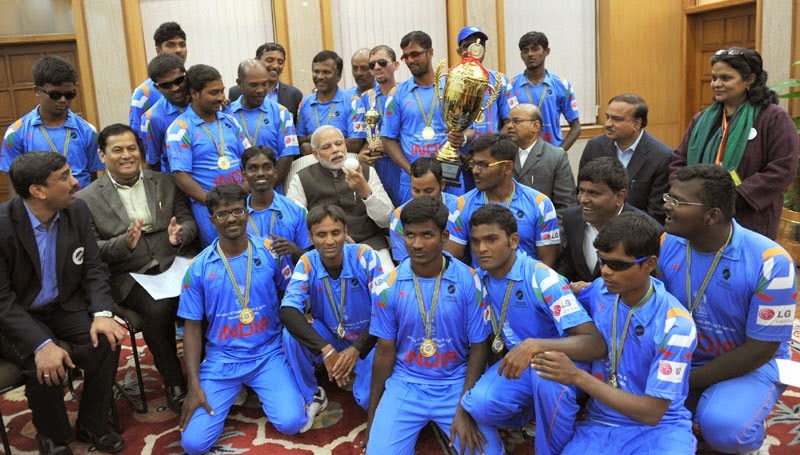 The Prime Minister met each of the cricketers individually, and posed for photographs with them. The Prime Minister, Shri Narendra Modi, was today presented a unique portrait created through the technique of "IKAT" or "Tie and Dye." 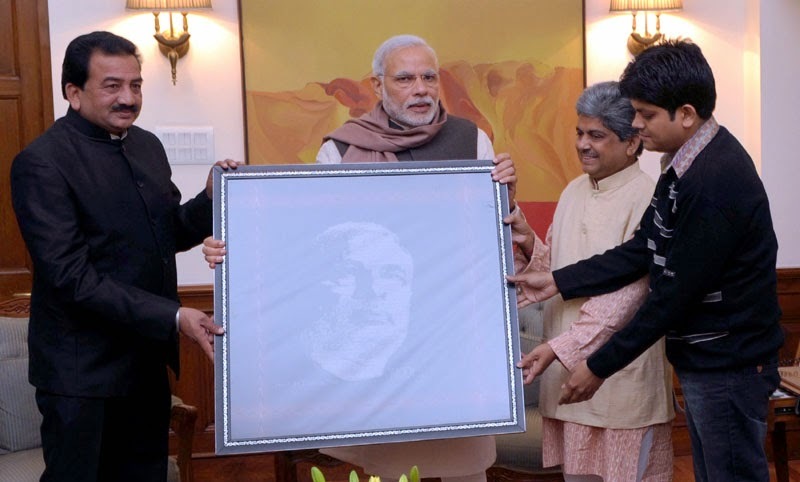 The portrait of Shri Narendra Modi is a creation of Shri Surendra Meher, made in the style of traditional IKAT weaving from Odisha. Shri Surendra Meher is a national and UNESCO awardee. The portrait is a unique experiment in fusion of tradition and modernity in IKAT weaving. On the occasion of the Nobel Peace Prize ceremony in Oslo, the Prime Minister, Shri Narendra Modi, congratulated the award winners. "The entire nation watches the ceremony in Oslo with great joy and immense pride. Congratulations Kailash Satyarthi! I also congratulate the young Malala Yousafzai for the momentous achievement," the Prime Minister said. 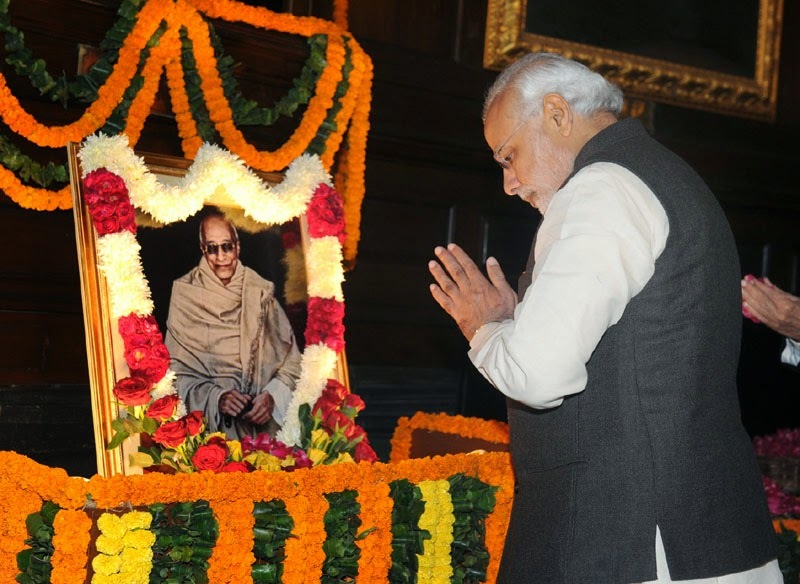 Prime Minister Shri Narendra Modi has paid tribute to C Rajagopalachari on his birth anniversary. "I offer my tributes to the great freedom fighter, scholar and thinker par excellence, Shri C Rajagopalachari on his birth anniversary. 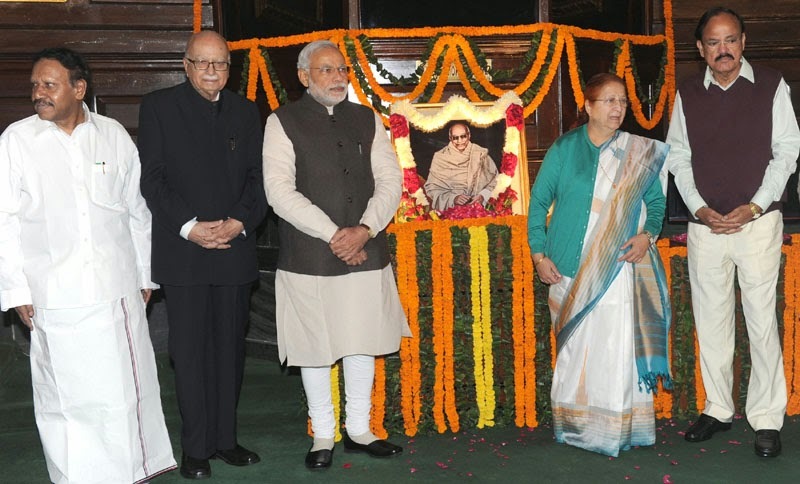 Rajaji was known for his administrative and political skills as well as for his literary and cultural pursuits. A remarkable personality!" said the Prime Minister.